New Year's Eve parties are not reserved for adults! Kids love to celebrate the new year, too, and planning a family-friendly party is simply a matter of finding foods that young and old will enjoy. A good approach is to go with tried and true favorites like delicious dips, tasty appetizer bites, and yummy desserts so guests can snack away as they please. These recipes were chosen because they have long been party favorites and they're super easy! They can be made or prepped ahead of time, so when the day comes you can enjoy the celebration along with your guests. 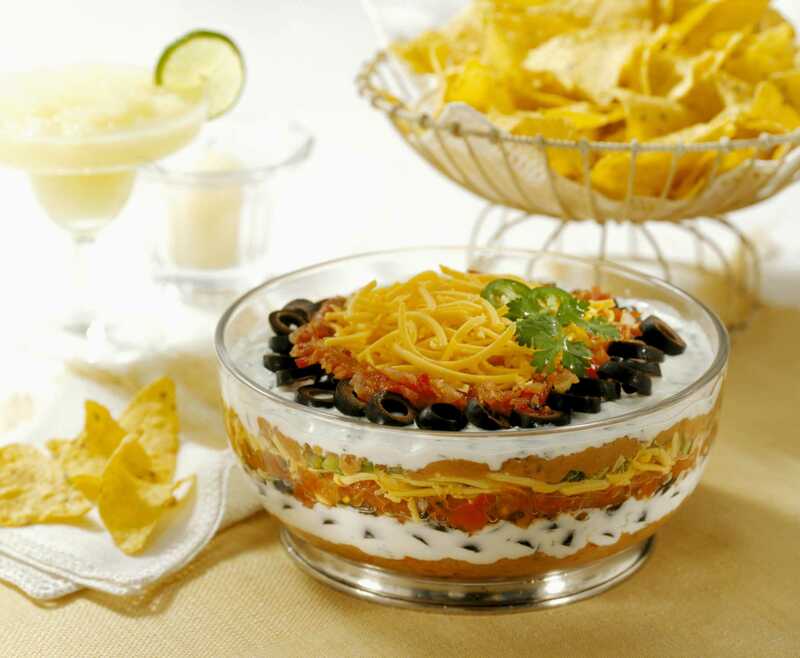 A seven layer Mexican dip is a party staple in many households. It has everything that everyone loves about taco night, but in a convenient dip that's ready for tortilla chips. It's perfect for snacking and it comes together in a matter of minutes, though you might want to try homemade guacamole to make it just a little bit better. Everybody loves the flavor of sweet, juicy strawberries paired with chocolate and chocolate-covered strawberries appeal to both kids and adults. There's no secret to this sweet treat, either. All you need is strawberries and chocolate—even chocolate chips will do! Almost everyone finds spinach dip irresistible, even kids! This particular recipe will make you super happy because it's so easy to make. Simply toss a few ingredients into your crock pot. In less than an hour, you have a creamy dip that's ready for the party! Keep everyone snacking with a classic Chex party mix. Bite by bite and handful by handful, this crunchy cereal, pretzel, and nut mix will disappear fast. It's flavored with butter, Worcestershire sauce, garlic, and onion and baked slowly so it's nice and roasted. If you're short on time, there's a microwave method, too! Don't worry about people who claim they don't like spinach, these yummy spinach balls will turn them around. They're like meatless meatballs and the recipe makes 48 of the delicious little bites. It's a fun finger food that can be dipped in anything from mustard to marinara. Who doesn't like deviled eggs? This recipe is a classic, and it makes a good, healthy snack for kids who might be too excited to sit down and eat at a New Year's Eve party. Adults will keep stopping by the appetizer table, too, so you may want to make a double batch! Every party needs a plate of cookies! Since New Year's Eve is a special night, treat guests to these special cream cheese crescent cookies. They're delicious and come in a fun shape that makes them look more difficult to make than they are. You can also have the kids help decorate them with chocolate and sprinkles. Crispy tortillas filled with melted cheese and whatever else you like, quesadillas are another guaranteed hit at any party. Keep them simple with a couple types of cheese or add diced chicken, chiles, and salsa. Or, you can get fancy with combinations like asparagus, feta, and mozzarella. The possibilities are endless and everyone will love them! Turn your slow cooker into an appetizer station everyone will flock to and serve these crowd-pleasing cranberry cocktail meatballs. The recipe features homemade meatballs drenched in a sauce of sweetened cranberry sauce and chili sauce. It sounds odd, but it works and this is a recipe you'll rely on time and time again. Do you like your brownies cake-like or fudgy? There's no need to choose with the ultimate brownie recipe because it's the best of both worlds. None of your guests will turn their noses up to these bites of chocolate goodness and they'll probably be back for more!